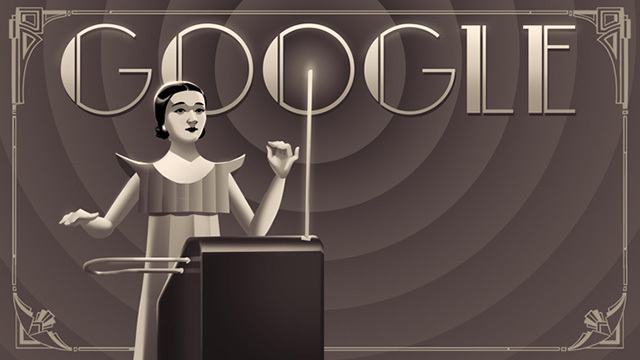 The Google logo today is for Clara Rockmore on her 105th birthday and it specifically calls out her Theremin, an electrical music instrument. Which is why Google decided to give her a Doodle. Today's interactive Google Doodle was created by artist Robinson Wood, interaction designer Kevin Burke, and engineers Will Knowles and Kris Hom (with support from the larger Doodle engineering team). The team translated the movement used to play the theremin—one hand controlling pitch and the other volume—to an interactive module, where a point of light controls volume and pitch. Sound designer Manuel Clément helped with the button sound effects. Google has a ton of details behind what went into this Doodle over here. Clara Rockmore was born on March 9, 1911 in Vilnius, Lithuania and died on May 10, 1998 in New York City.